In a case over bad faith litigation and whether costs were recoverable, a Court recognized the importance of those who perform eDiscovery work. The crux of the issue is that clerical work is not a recoverable cost, while the work a paralegal does to support an attorney is recoverable. 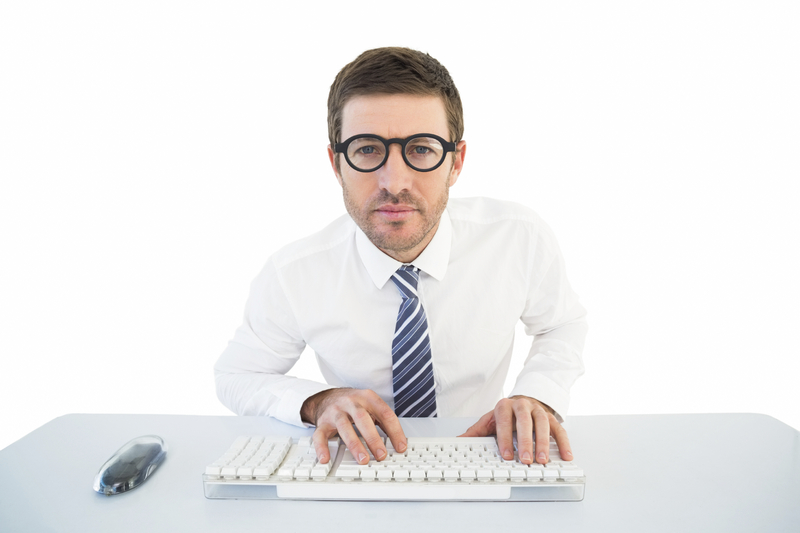 Would the work performed an eDiscovery professional be recoverable like a paralegal’s work? …while technology specialists’ duties are not strictly legal in the traditional sense, the Court believes that these technicians provide meaningful value to law firms and, ultimately, clients during litigation; those contributions should not go overlooked. In time past, young attorneys would select documents that paralegals would incorporate into specially created databases — e.g., “hot docs,” “Top 100 documents,” or documents specific to a particular witness or witnesses — and maintain them for the senior lawyers’ review. As technology developed, however, paralegals began uploading documents into databases which could then be searched and sorted using queries. Now so much is on ESI; the technology specialist helps produce documents and keep documents produced by other parties. These technology specialists now do some of the specialized work that paralegals used to do. General Protecht Group v. Leviton Mfg. Co., 2015 U.S. Dist. LEXIS 109981, *95-96. There is no sound reason to pay paralegals for document work in the 1980s and 1990s, but not technology specialists doing similar work in 2015 just because their job titles are different. The specialist is improving the quality of work product, and as a sensible approach, the case law should not penalize the practice in the legal community that is becoming more technology-based and efficient. Specialists may actually save money. 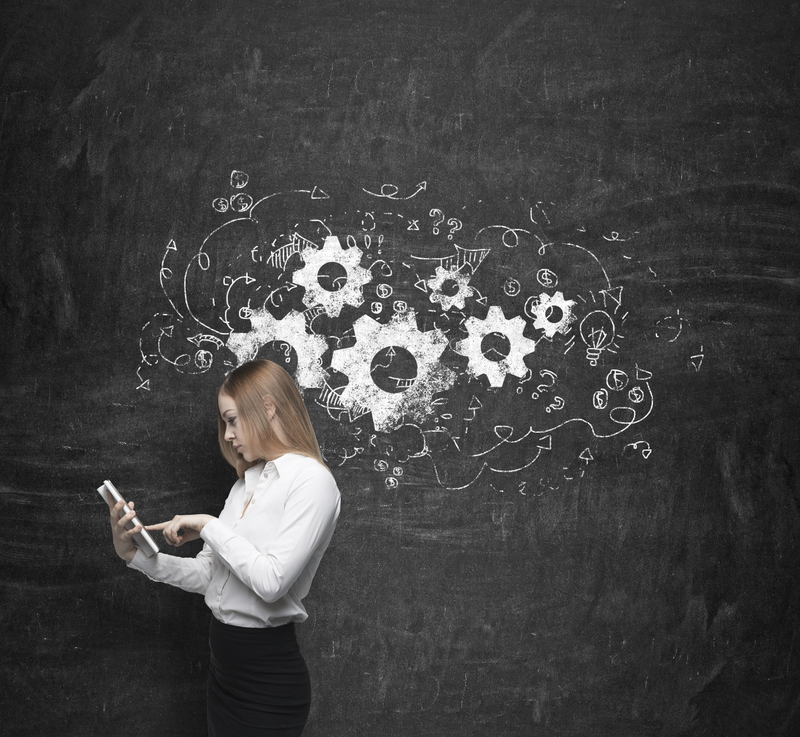 Having a technology specialist for a single case is not unusual, and it can be more efficient sometimes to hire a specialist for a case than use a paralegal. To do otherwise would be to allow the case law to lag behind the introduction of document management products and databases in the twenty-first century. The proof that technology specialists are now doing legal work is that law firms hire technology specialist employees. Many years ago, few firms had paralegals; now it is the rare firm that does not have one or two. Forty years ago, few firms had specialists to manage documents; now, firms with twenty or more lawyers can justify hiring technology specialists for the job, and smaller firms may hire them on a contract basis. Today, when a client hires a law firm, it is hiring its paralegals as well as its technology specialists. 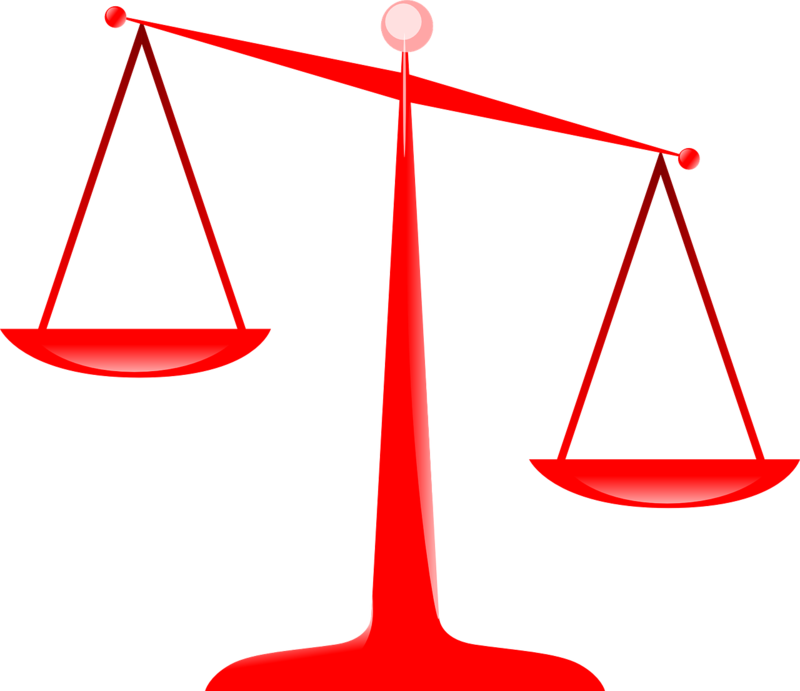 When marketing their work, firms often quote their paralegal rates with their attorney rates. Document management is in great part what law firms do today, and clients expect to pay for that work. It is only fair for courts to follow the legal profession’s development of new means of providing high-quality representation and recognize technology specialists’ contributions as being legal in nature. The Court would therefore include technology specialist fees in its calculation of attorneys’ fees, subject to the same restrictions placed on other attorneys’ fees, i.e., that the technology specialists work pertained to the lawsuit at hand, and the hours were reasonable. General Protecht Group, at *96-98, emphasis added. Handling electronically stored information takes skill. Lawyers cannot upload self-collected PSTs from a client and review the data into Outlook. The data is likely corrupted from an indefensible collection. Moreover, using Outlook for document review is like crowbar for dentistry; it is not the intended use of the tool. Attorneys need to understand how to identify relevant electronically stored information for preservation, develop defensible collection methodologies, and competently conduct review in a reasonable manner for everything from a reasonable inquiry to initial disclosures to production. Being able to execute a litigation workflow is not just required for defensibility, but the competent practice of law. Most lawyers require having someone assigned to manage these tasks under the attorney’s direction. Regardless of title, seeing a Judge state that “technical specialists” improve the quality of work product for efficiency is outstanding for the practice of law. Thanksgiving time is one for reflection. 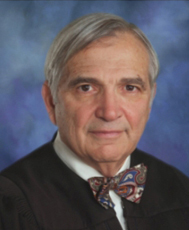 I have been thinking about Judge John Facciola’s impact on the world of eDiscovery with his upcoming retirement. I am very thankful we had such a dedicated judge who has been such a leader in electronic discovery. Judge Facciola had his share big cases, but the important ones are the cases that give a nuts and bolts framework on how to actually litigate issues surrounding electronically stored information. Judge Facciola excelled at these cases and showed a profound willingness to be hands on in solving issues, from search term efficiency to hosted repositories. The Judge’s commanding use of language is second to none, with many memorable quotes. The good Judge is a profoundly thoughtful individual, whose interests include sailing, baseball, history, and a strong dedication to our justice system. I wanted to share a couple of stories I had with the Judge over the years. I met Judge Facciola on Super Tuesday 2008 in Washington, DC. I was in DC for a conference and had a webinar planned with him later in the month. I wanted to take the opportunity to meet him in person since I was in town. We had lunch in the judges’ dining room that overlooks the US Capital Building. It is still surreal to remember, seeing other judges eating lunch and discussing matters of importance. To this date it is still one of the most memorable events in my career so far. After leaving the Courthouse, I met up with some attorney friends. We watched the Super Tuesday results at different campaign parties at some of DC’s more entertaining pubs, but that adventure is another story. I visited DC in 2013 for a business trip. I contacted the Judge if he had time to meet for lunch or coffee while I was in town. He offered to meet for dinner at the Cosmos Club. I am normally well versed in history, but I had to look up the Cosmos Club. The Club was founded in 1878 dedicated to the advancement of art, science, and literature. Its members included Alexander Graham Bell, Woodrow Wilson, and virtually every Secretary of State. There is no question the Cosmos Club was the most regal institution I have ever entered. For me, it represented those dedicated to knowledge with a true sense of class. The library was simply majestic, where one could be lost for hours in study. The Judge and I enjoyed a good meal, discussing the law, film, boats, and of course US History. At a prior dinner before Legal Tech 2009, we discussed the sinking of the USS Indianapolis and the unfair court martial of Captain Charles McVay III, leaving the others looking at us in respectful confusion. While we were discussing topics from eDiscovery to President Garfield, another dinner party walked by our table. The person in the lead looked familiar, but I could not identify the dinner guest. Jessica Mederson and I invited Judge Facciola to record an Independence Day podcast for our blog The Legal Geeks. Judge Facciola truly loves the United States. The Judge shared his thoughts on the 4th of July, the meaning of Independence, and the role of the Judiciary in upholding the promise of the Declaration of Independence. Jess and I were clearly in awe of what the Judge had to say about our country and freedom. Judge Facciola leaves a powerful legacy of civic duty, honor, and a strong work ethic. I wish him well in his future adventures, whether they are out sailing or well-earned time with family. Thank you for your service, Your Honor. Moreover, thank you for the tip about Beau Ties Ltd of Vermont. Wonderful collection of bow ties. Guest Post on Everlaw: Is An Attorney Responsible for Manually Reviewing Discovery Before Production? I prepared a guest post for Everlaw’s blog on an attorney’s ethical duty to follow a client’s instruction to manually review documents prior to production. Is expert testimony required to show a lawyer breached their standard of care or is this issue one a jury can decide on their own? What is an attorney’s Duty of Loyalty to review discovery documents before producing them to an opposing party? That issue recently arose in a summary judgment battle between a client and his former attorneys. The client claimed that the law firm had committed malpractice because the attorneys failed to review discovery responses before production to the opposing party – after being directed to do so by their client. Things really went wrong when the client was hit with sanctions, and the law firm denied knowledge of certain documents in court. Price Waicukauski & Riley v. Murray, 2014 U.S. Dist. LEXIS 130680 (S.D. Ind.Sept. 18, 2014). Continue reading at Is An Attorney Responsible for Manually Reviewing Documents? 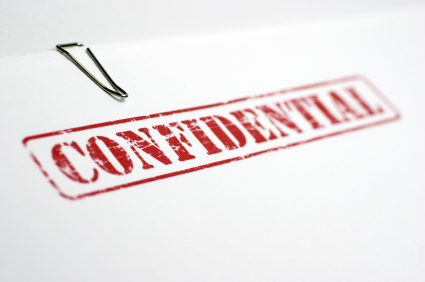 What do parties do when they anticipate documents, testimony, or information containing or reflecting confidential, proprietary, trade secret, and/or commercially sensitive information are likely to be disclosed or produced during the course of discovery, initial disclosures, and supplemental disclosures in a case? Agreeing to a protective order is a the solution the parties sought in Farstone Tech., Inc. v. Apple Inc.
Where electronic files and documents are produced in native electronic format, such electronic files and documents shall be designated for protection under this Order by appending to the file names or designators information indicating whether the file contains “CONFIDENTIAL,” “CONFIDENTIAL – ATTORNEYS’ EYES ONLY,” or “CONFIDENTIAL – OUTSIDE ATTORNEYS’ EYES ONLY – SOURCE CODE,” material, or shall use any other reasonable method for so designating Protected Materials produced in electronic format. When electronic files or documents are printed for use at deposition, in a court proceeding, or for provision in printed form to an expert or consultant pre-approved pursuant to paragraph 12, the party printing the electronic files or documents shall affix a legend to the printed document corresponding to the designation of the Designating Party and including the production number and designation associated with the native file. No one shall seek to use in this litigation a .tiff, .pdf or other image format version of a document produced in native file format without first (1) providing a copy of the image format version to the Producing Party so that the Producing Party can review the image to ensure that no information has been altered, and (2) obtaining the consent of the Producing Party, which consent shall not be unreasonably withheld. Farstone Tech., Inc. v. Apple Inc., 2014 U.S. Dist. LEXIS 89604, 10-12 (C.D. Cal. June 24, 2014). 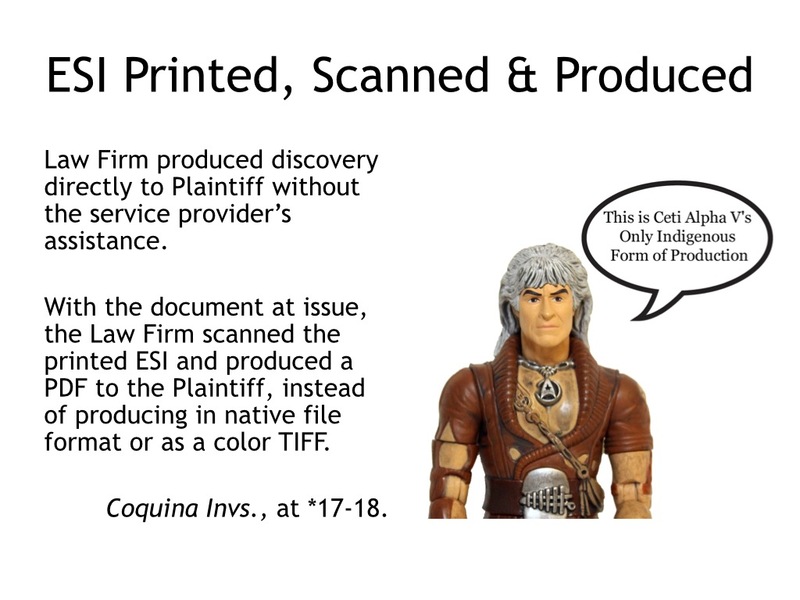 The section of depositions demonstrated a lot of forethought on behalf of the attorneys who prepared the stipulated protective order (or Judge) with the party printing the electronic files or documents shall affix a legend to the printed document corresponding to the designation of the Designating Party and including the production number and designation associated with the native file. The only way this could be stronger would be the legend also including a MD5 hash value for authentication (which it potentially would include) and the system file pathway. The final sentence on allowing review of a static image to the opposing side for review also addresses a concern many attorneys have over native files converted to static images. There is the obvious method of reading the document to determine it is “identical,” but using near-de-duplication technology to verify the text is an exact match, assuming the static image is a searchable PDF. If it is a TIFF, then conducting a line by line comparison is the best option. My compliments to the attorneys who drafted the stipulated protective. I hope the litigation avoids any discovery disputes and focuses on the merits. ExxonMobil Pipeline had a problem in discovery: their discovery responses were overdue. The requests for production was served in November 2013 and due after one extension in January 2014. The Plaintiffs rightly brought a motion to compel. The Defendants had enough discovery to give most eDiscovery attorneys a migraine with a nosebleed: 16 separate lawsuits, with 165 discovery requests in one case, a total of 392 requests in all the related cases, and 83 custodians with approximately 2.7 million electronic documents. Other discovery going back to 1988 had over 63,000 paper documents that were scanned and to be searched with keywords. Additionally, there were approximately 630,000-800,000 documents that had to be reviewed for responsiveness, confidentiality, and privilege. The Defendants had produced 53,253 documents consisting of over 191,994 pages. 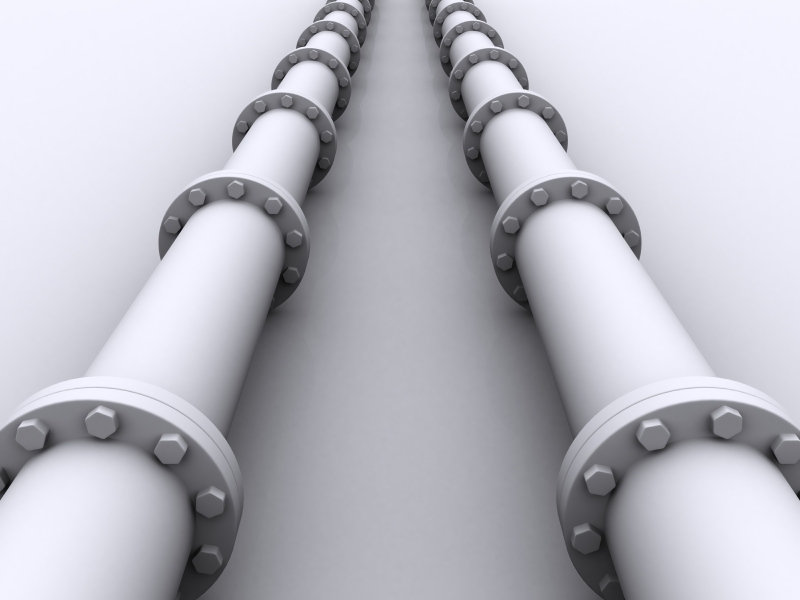 United States v. ExxonMobil Pipeline Co., 2014 U.S. Dist. LEXIS 81607, 5-8 (E.D. Ark. June 9, 2014). The Defendants suggested using predictive coding in light of the large volume of discovery, but the Plaintiff the United States did not agree with the use of predictive coding (at least since the filing of the motions). ExxonMobil Pipeline, at *6. Moreover, the parties did not seek relief from the Court on the use of predictive coding, other than to order the parties meet and confer. ExxonMobil Pipeline, at *6-7. The Defendants explained that using traditional review with 50 attorneys that document review could be completed by the end of June 24 and production by the end of August 2014. ExxonMobil Pipeline, at *6. The United States disagreed with the Defendants assumption of lawyers only reviewing 250 documents/files a day. Moreover, the Defendants did not raise concerns about document review when they entered an agreed upon scheduling order in October 2013. ExxonMobil Pipeline, at *6-7. The Court acknowledged that the Defendants had a large volume of discovery to review. Moreover, it was unclear if the parties had agreed to a review methodology before the Court issued its order. Regardless, the Court ordered the Defendants to complete their review and production by July 10, 2014, absent good cause. ExxonMobil Pipeline, at *7-8. 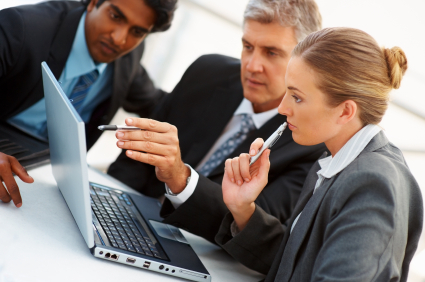 Most attorneys do not think about document review strategies at the beginning of a case. They should. Discovery is the backbone of civil litigation. Unless you know the information you have to review, strategies to maximize efficiency, and reviewing for claims or defenses, document review can be a nightmare experience. This case does not go into why the Defendants sought agreement from the Plaintiff on the use of predictive coding. I do not agree with that strategy, unless a specific review protocol was ordered at the Rule 16 conference that the producing party wanted to change. The issue with a document production is whether or not the production is adequate. Lawyers should agree to the subject matter of the case, custodians, data ranges, and other objective information that goes to the merits of the lawsuit. When lawyers start asking each other for permission on whether they can use predictive coding, visual analytics, clustering, email threading, or any other technology, civil litigation becomes uncivil. Case in point: the Plaintiffs argued the Defendants could review more than 250 documents a day in this case. Such disputes turn into an academic fight over how much lawyers can read and analyze in a 9-hour workday. The end result of such motion practice would be a Judge ordering lawyers to read faster. My advice is to focus on the merits and not derail the case with a fight over what review technology can be used. Fight over whether the production is adequate, not what whether you can use predictive coding. I had the honor of speaking at the 2014 Arkansas State Bar Annual meeting on eDiscovery Ethics and new trends in eDiscovery in Hot Springs, Arkansas. 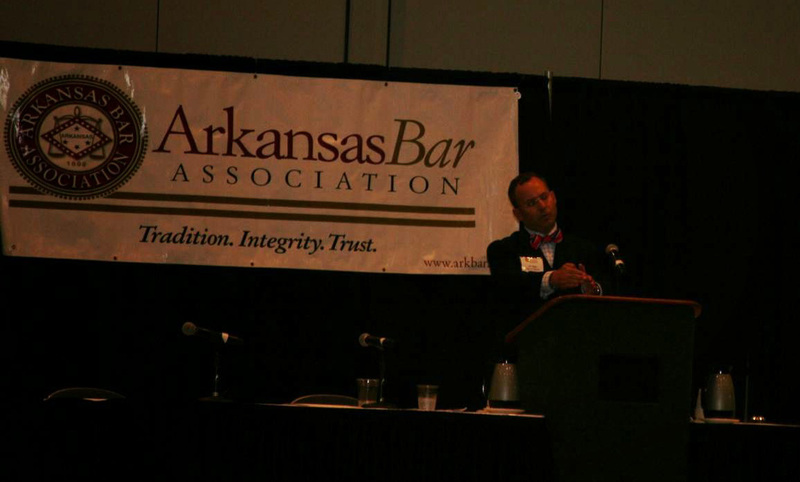 I had an amazing time and greatly appreciated the hospitality of the Arkansas Bar Association. 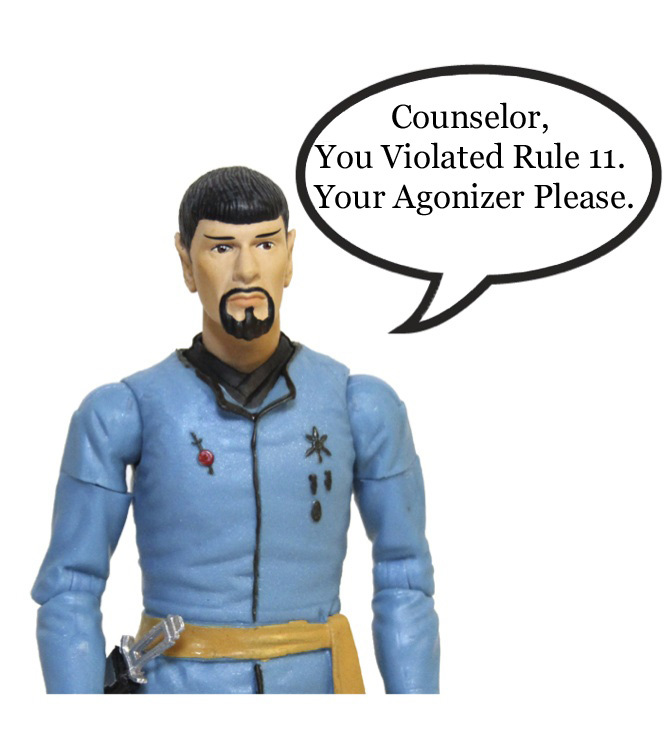 My new Ethics seminar is a Star Trek themed presentation based on the Ingenuity 12 LLC v Doe case, that also covered the evolving rules of attorney and judicial ethics on social media; how to conduct a reasonable inquiry with ESI; the duty of candor to the Court; compliance with Rule 11 in an age of Terabytes; Production obligations under FRCP 26(g); and the duty of confidentiality and computer security. It was also a ton of fun. 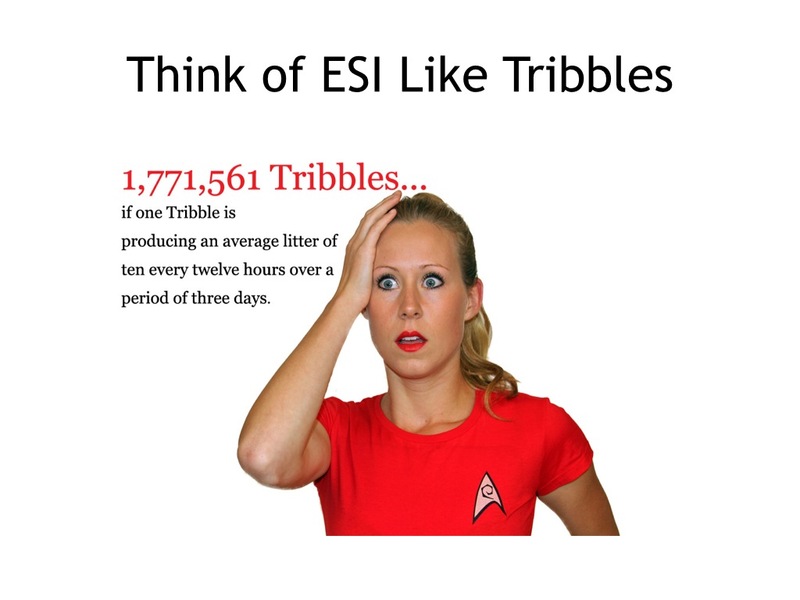 Produce responsive ESI in a recognized and appropriate manner. Proposed Formal Opinion Interim No. 11-0004 (ESI and Discovery Requests) (State Bar of California). This proposed opinion has teeth, because lawyers who are not competent in eDiscovery should either learn how to handle eDiscovery issues, associate with those who are, which can be retaining an expert, or decline representation. Given the fact virtually all civil litigation has data of some kind in it, the third option could end careers. “Tweeting Discovery,” my second session, explored recent social media/eDiscovery issues. The material also covered two of the new and proposed statutes limiting the use of Drones by law enforcement. The Drone limitations would prohibit law enforcement to use Drones to gather evidence, images, sounds, or data. The key exceptions would be in a high risk of terrorist attack, finding a mission person, preventing imminent loss of life, or a search warrant (limited in scope to only person subject to the search), and data retention rules. See, 2013 ILL. ALS 569 and 2013 Bill Text NC H.B. 312.